A summary of all the Spanish house price indices and forecasts published in Q3/November. The National Institute of Statistics (INE) official House Price Index was -15.2pc in Q3, the biggest fall on record topping off 18 months of continuous price declines. Resale prices were down 16.4pc, and new builds down 13.6pc (chart above). 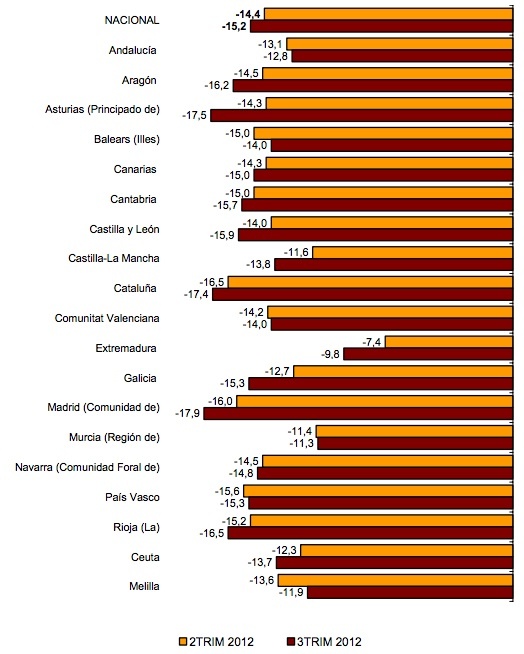 Prices fell the most in Madrid (-17.9pc), Asturias (-17.5pc) and Catalonia (-17.4pc), and the least in Extremadura (-9.8pc). The following chart shows all the regional house price changes (annualised, Q3 in red, Q2 in orange). The other “official” house price index, this one from the Department of Housing in the Ministry of Public Works (Fomento) was -9.5pc in Q3. 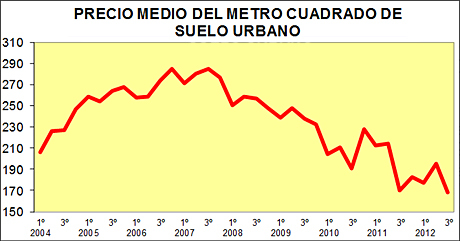 Fomento also published figures showing urban land prices down just 0.7pc over 12 months, but -13.9pc over 3 months. Land transactions were up by 7.9pc in a year to 3,826 sales, but down 17.6pc by surface area (to 4.2 million m2) and down 16.7pc by value. The following chart illustrates how far the land market has fallen. 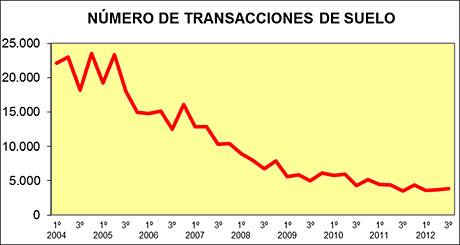 Data from the property portal Fotocasa.es, analysed by IESE Business school, showed house prices down 9.1pc over 12 months to the end of Novebmer. 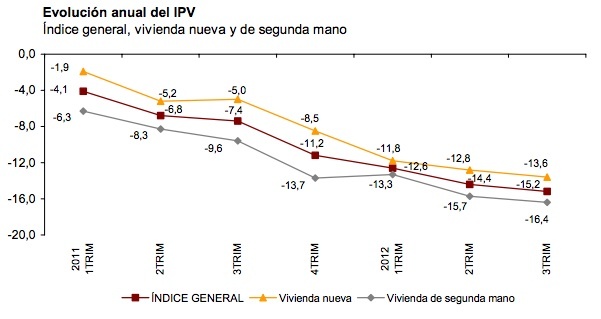 Property portal Pisos.com – 10.6pc in November, and they forecast another -10pc next year. Appraisal company Tinsa for November: General house price index -12.3pc, coastal areas -15.2pc, Balearic and Canary Islands -9pc. Peak-to-present -41pc on the coast, -26.7pc on the Islands. The international investment bank Merrill Lynch say prices will fall another 10pc before touching bottom and then bumping along it for a few years. The expect it will take three years to deal with the excess inventory. The ratings agency Moodys also forecasts more price falls next year. Yes, the Merrill Lynch forcaste looks about right to me. Coastal properties should bottom out at 1100 – 1200 Euros psm and stick there for a few years, perhaps for a decade. A re-run of the 1990s. But still not super cheap considering the average price on the Costa del Sol as recently as Dec 1999 was the peseta equivalent of just 700 Euros psm – ah those were the days. It’s going to be a 2 level market. Dross that will never sell and good that will start to rise in price as buyers compete. Already seen now where we are being rushed to complete building surveys so that buyers aren’t gazumped. The CGT and IVA thresholds are also having an effect. Will these benefits be renewed on the 1st Jan?